They came from 28 states and five countries and they all shared common bonds – an interest in space exploration and a commitment to use social media tools like twitter to spread their experience with friends and followers as it happened. 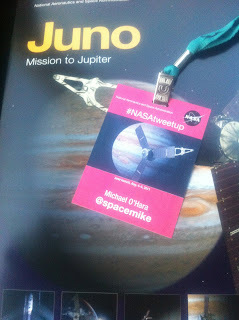 One hundred and fifty were selected to participate out of thousands that submitted their name for the NASA Juno Tweetup. Everyone came excited to witness the American Space Program continue its unmatched excellence in robotic exploration of the solar system. Many were veterans to the space center having attended previous launches; some were first time witnesses to the allure of rockets and space. Whether a launch veteran or a space novice, no one would leave disappointed. Even the lingering threat of a Tropical Storm churning nearby and the uncertainty of its direction would not rain on this event. Sunshine prevailed and it would turn out to be two very memorable and picture perfect days at the Kennedy Space Center in Florida. If we had gathered to just witness the launch of the Juno probe to Jupiter it would have made for a great event, but the mission did not begin or end there. By the end of day one we had a full understanding of the mission and had toured the Juno launch pad, the Atlas V Spaceflight Operations Center, and the Delta II rocket that will carry the GRAIL probes around the moon. As if that was not enough to make anyone go back to their hotel and dream of space, we also toured the cathedral of human spaceflight, the Vehicle Assembly Building with the Space Shuttle Discovery parked inside. Some may think that referring to the VAB as a “cathedral” is over exaggerating and taking it too far, but not for someone who dreamed of being an astronaut and was inspired by humans reaching deep into their imagination to journey to the moon. Those that were standing in the sands at Kitty Hawk to watch the Wright Brother's first flight must have thought that one day they would touch the clouds and see our planet from high above the treetops. Now, I stood in the shadows of where rockets and humans left Earth to visit other worlds and still with my insatiable curiosity and a thirst to explore the universe. It was a place where rockets rolled in and dreams rolled out. Space is where we must look to answer the questions of why are we here, how did we get here, and are we alone. I have come to learn that curiosity is one of the most important drivers in life. To be always chasing questions and looking for answers to our universe’s greatest mysteries is not a futile effort, but a lifelong learning experience.